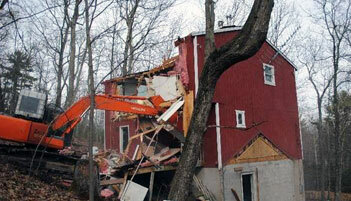 Shea Industries Inc. We are your complete industrial, commercial and residential demolition service company. Joe Shea and his crew head to Williamsport to tackle their biggest job yet - a 75 day demo of an old furniture factory the size of an entire city block. 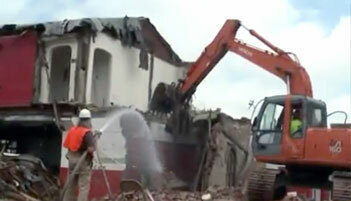 The team is called on to demo an old bank in Plains, PA. It's an easy job on the surface, but there's a catch... inside is an extremely valuable safe that needs to be extracted without damage. This is no easy task, but Joe and his crew are up for the challenge. SCRANTON, LACKAWANNA COUNTY (WBRE/WYOU) - Weather conditions were perfect for a Scranton company to display its patriotism on this Fourth of July. Last year, workers at North American Manufacturing created what they believe is the world's largest, free-flying American flag. On Tuesday they got a chance to show it off. Delaware Township -- Demolition of some 20 homes is now under way from Little Egypt Road in Lehman Township into Delaware Township, along Milford Road. It will continue until the end of March, weather permitting. Shea Demolition of Scranton is removing the homes under a $300,000 contract for the Pennsylvania Department of Transportation. PLAINS TOWNSHIP -- For years, it was a bank in Luzerne County. Then it became part of a store. 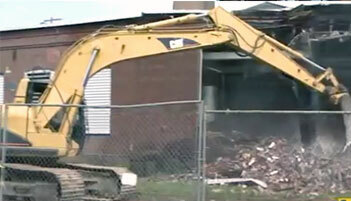 Now what people call a landmark in Plains Township is being torn down. Layer by layer, pieces of Plains Township history tumbled to the ground. "I don't like it, but I guess we have to get used to it." 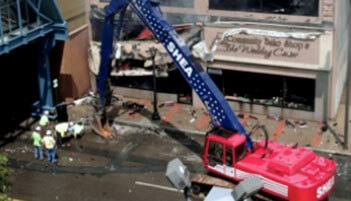 The former Citizens Bank building is coming down after years on the corner of Main and West Carey Streets. 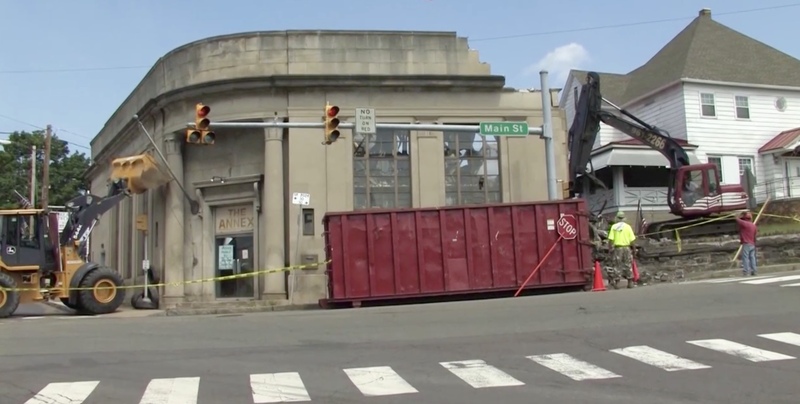 Scranton -- A contractor moved quickly Friday to take down the fire-ravaged Community Bake Shop building after part of the structure collapsed unexpectedly during what Scranton officials had hoped would be a slow, methodical demolition. LANSFORD -- A historic building is being torn down in Carbon County to make way for a new place for firefighters. 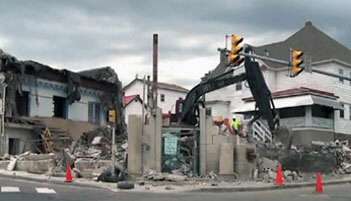 On Monday, demolition crews started to tear down what used to be the town hall in Lansford. Up until last week it also served to house some fire department equipment. A new larger building will be built in its place. "That building was built in the early 1900s and the size of the apparatus today is a lot bigger than it was then," said Lansford Assistant Fire Chief Ron Hood. "This building, I hate to say it, was going to the dogs. It was left go and the cheapest thing to do is tear it down," Tom Staruch, Lansford Fire Department..
WILLIAMSPORT -- Demolition crews are tearing down an old factory in Williamsport to make way for housing. Heavy machinery took the first swipe at the brick wall thats part of up former Brodart furniture factory in Williamsport. The one, two and four-story buildings take up an entire city block between Memorial Avenue and Scott Street. SCRANTON -- A building where science students at the University of Scranton studied for decades is coming down. 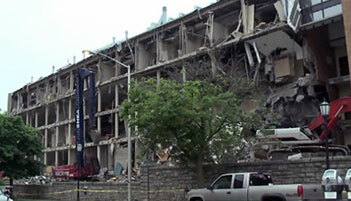 Demolition crews began tearing down Loyola Hall on Thursday.